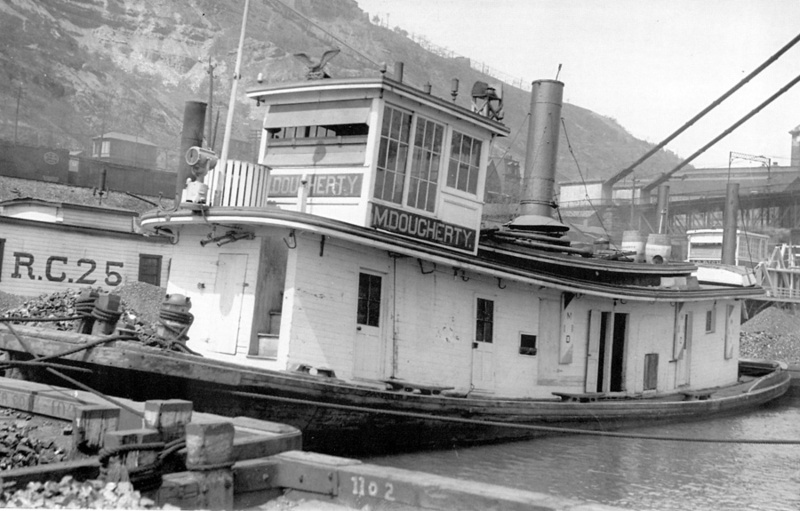 The Tug M. DOUGHERTY is mentioned numerous times by JW in his journals. He normally writes that the Tug MIKE DOUGHTERY is at the Ways, mis-spelling the last name and referring to the full first name as MIKE. The first mention is October 29, 1911. One of the many that followed was twelve years later on March 30, 1923 when the Tug goes in for a complete overhaul . JW gives more details of this final visit on May 10, 1923. Use the search engine on the Home Page to find all the entries and remember to spell the name as JW normally did. The R.C. 25 seen behind the M. DOUGHERTY is Pump Boat 25. This boat was at the Ways on April 27, 1920 and June 2, 1923. Both of these journal pages also have the M. DOUGHERTY at the Ways.